Though he meets with her strictest disapproval, a bond of sorts soon forms between Jun and the brazen doll, Shinku, the fifth in a series of exclusive ‘Rozen Maiden’ creations. As the series unfolds more of the dolls are introduced, whereupon meeting one another they take part in a dangerous battle known as the ‘Alice Game’: the loser is transformed into a regular doll, the victor increases their power and becomes less reliant on their human ‘medium’. The cruel and arrogant Suigintou, the first to be crafted by the elusive master dollmaker Rozen, is especially keen to succeed at the game, and provides an enjoyable contrast to the other, more childlike dolls of the series. Through his adventures with Shinku, Jun also takes the first steps toward healing, with his sister providing a sweet and loving counter to his misanthropic temperament. Alternate dimensions, dream worlds and spirits all occupy this oddly compelling and flawlessly rendered world. If the idea of a series about talking dolls strikes you as a little off-putting, rest assured: it’s superb! 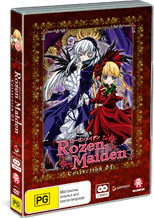 Rozen Maiden’s screenplay is well-crafted, its storyline is imaginative and overall the series proves thoroughly enjoyable. The aristocratic Shinku makes a great lead character, and her disdainful observations and Jun’s efforts to keep her contented are hilarious. The animation is also excellent throughout, with inventive character designs and superbly detailed backgrounds abounding. Both English and Japanese audio options are available, and the voice actors do a wonderful job on each. Furthermore the score is quite beautiful, and it’s clear that no expense has been spared in this or any other regard. Though glossing over the more disturbing aspects of the disease, the references to hikikomori also provide an angle that is rarely explored in either animated or live-action releases, and allow the action to revolve around the reclusive Jun and his psychological development in a way that is engaging yet uncontrived. Overall, for what it’s worth, this is one of the best animated series I’ve ever seen, and one that will appeal to a wide variety of age groups and viewing predilections. There are no real deficiencies, and any effort to find fault is largely nitpicking: the up-tempo J-Pop theme is somewhat jarring and at odds with the rest of the score, and the subtitles incline toward brevity on the Japanese dub. Like I said, nitpicking! I really can’t recommend this stunning series highly enough.